A clutch of pb times and some promising performances for newcomers and established 10k runners alike as RH fielded 6 quality performers in the Good Friday race. 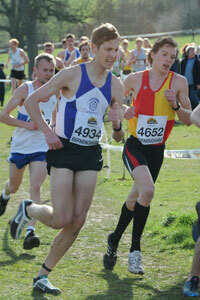 Philip Hoole led us home 5th with a pb 30:26 in a race won won in 29.50 by Jack Martin (Stockport). With Richard Harris 20th and 2nd M40 in 32:20 (a 4-yr best and showing continuing recovery from injury) and Chris Adams 23rd with a 1-minute plus pb reduction (32:58) he led RHAC to 3rd place in the high-powered team race behind Stockport and Salford. Aidan Johnson 26th in 33:02 was at the head of our second team as it finished, with David Smith extending his 10k experience with 34:39 (a big pb improvement) and Elliot Smales on his 10k debut at 35:16 making an impressive 9th team overall.